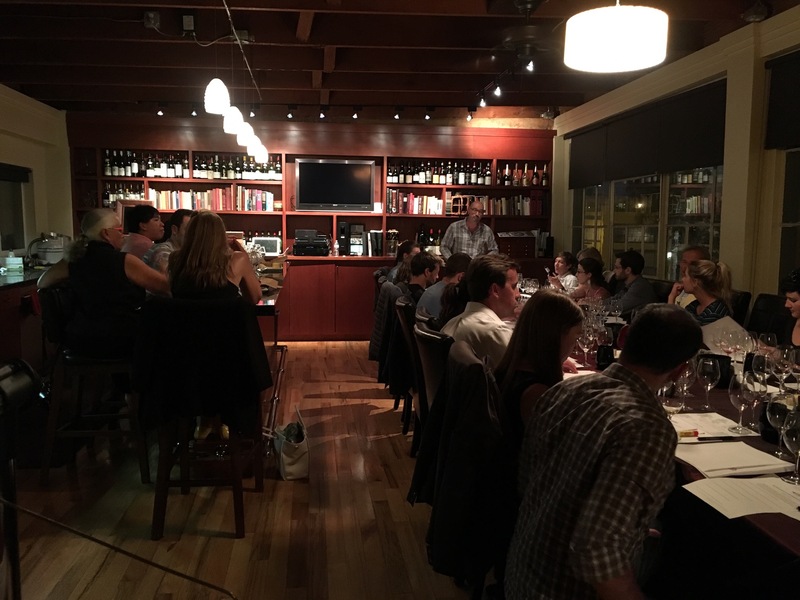 Last week we introduced a new blind tasting class with Mauro Cirilli – Taste Like a Pro! With the wines in brown bags so we couldn’t see the grape, producer, origin or year, we forced ourselves to evaluate each wine’s color, smell, flavor, sugar, acidity, alcohol, tannin, body and finish in order to guess the specifics that were hidden behind the bag. As Mauro said, a long finish is a sign of a high quality wine that you should be happy with… who doesn’t love when the wine lingers on your tongue long after it’s gone? Color tells us about the wine’s age; for white wines, a green hue indicates youth, while it becomes more golden with age; reds start out more purple and turn to red and orange with age. And the legs… don’t tell us much, other than the fact that the wine has alcohol. 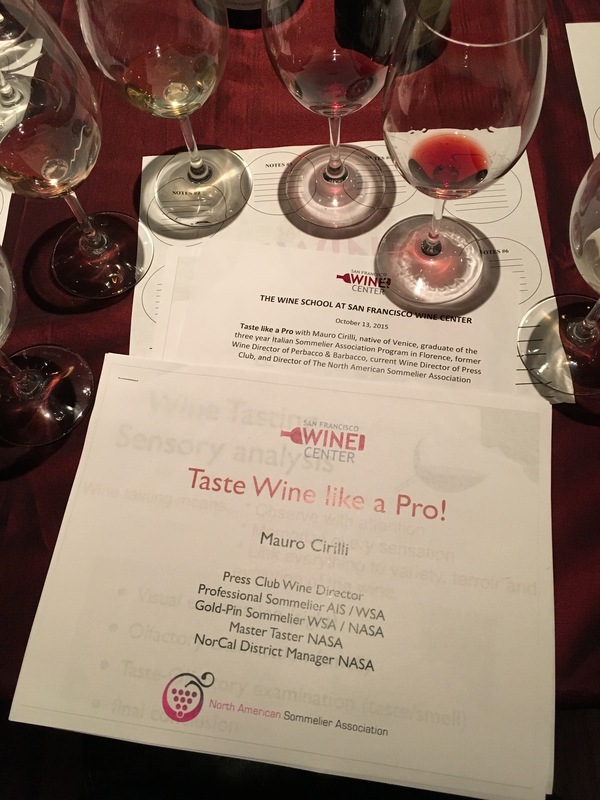 The tasting included 6 different classic grape varieties from various regions all over the world including 1 sparkling, 2 whites, 2 reds and 1 sweet. The sparkling wine had fine, smooth bubbles, a rich, nutty character and a long finish. Yes, this was most certainly Champagne! Champagne sets the standard for all sparkling wines with creamy bubbles and a rich, textured body. The first white had a green hue; it was lean and zesty with good acid, briny with ocean air. It was a Loire Valley Muscadet from France – not an easy guess! Next was a more typical white with a golden hue, aromas of limestone, nutmeg, stone fruit and vanilla. Creamy texture with lemon curd flavor. A white Burgundy? Actually it was a Russian River Chardonnay from here in California. Impressive! The first red had ripe fruit and some earthiness. It was high in acid (for a red) and low in tannin with a persistent earthy, flowery quality. Not a Pinot… this was a Grand Cru Beaujolais, made from the Gamay grape in the area south of Burgundy, France. The second red brought me right back to my honeymoon in Rioja, so I knew it was Tempranillo. Earthy, brambly fruit, vanilla and dill. This was Rioja Alta. For the grand finale, a dessert wine with orange zest, tropical fruit, white flowers… it was an ice wine from Dr. Loosen in Germany. A varied and educational tasting with wines representing San Francisco Wine Center and Mauro’s menu at Press Club.